Our team at Cadence stands ready to partner with you every step of the way. 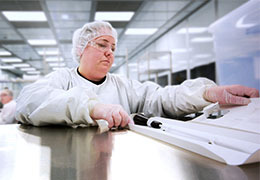 No matter how simple or complex a medical device or life science application, our automation capabilities, combined with our custom manufacturing solutions and Class 8 (100,000) certified cleanroom environment can help your product go from design to a tested, verified, and validated/finished product. Medical devices need to be commercialized using robust clean room manufacturing practices, so ask for a certified cleanroom and be sure to check the certification records for compliance. Visit our Cadence Device website for more information.